Royal City Rag has two sets of two tickets to give away for the show by Lights (with special guests, Michou) at Cowboys on Wyndham Street on November 26. A third set of two tickets has already been claimed by Gerry D. Tickets are the all-ages show are $25 each and available via all Ticketmaster outlets. If you’d like the tickets all you need to do is drop us a line to info@royalcityrag.ca. Twenty-two year-old Toronto singer and multi-instrumentalist LIGHTS has been crafting unique, otherworldly synth-pop since she was 14. LIGHTS’ songs have already garnered over 22 million plays on MySpace, and she has racked up a #1 hit on MuchMusic, inclusion in a series of Old Navy commercials, and airtime on The Hills. On the strength of her 2008 self-titled EP alone, LIGHTS won the 2009 Juno Award for New Artist of the Year, joining the ranks of Feist and Nelly Furtado. LIGHTS was also selected as an inaugural artist for MySpace’s new Introducing program, and she stars in her own short-form motion-comic series Audio Quest: A Captain LIGHTS Adventure, which aired on MTV and MTV.com. In fall 2009 she wrapped a North American headline tour, which included sold-out performances at New York’s Mercury Lounge and the Troubadour in Los Angeles. Most recently, LIGHTS completed a 6 week, sold-out, international tour with Owl City, as well as select dates on this summer’s Lilith Fair tour. 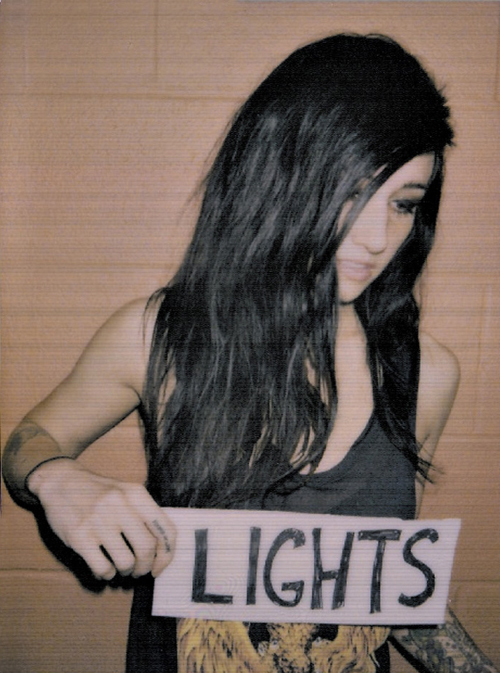 Don’t miss Lights when she performs at Cowboy’s on November 26! Lights tickets claimed by Gerry D, Elivia G and Brian T. Your complimentary tickets are at the door. Enjoy the show!